Oklahoma oilman Harold Hamm and his company Continental Resources have been an industry leader in: a) developing the energy-rich Bakken oil field, and b) introducing the advanced drilling technologies including hydraulic fracturing and horizontal drilling that have created an energy revolution here that is making the U.S. "the Saudi Arabia of oil and gas in the 21st century." "A lot of good news has been coming out of North Dakota recently. 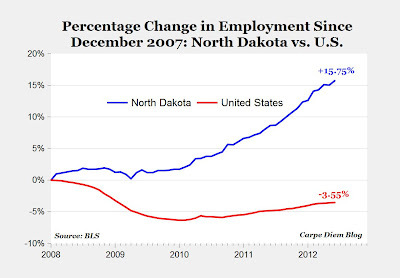 Most notably, the Bakken oil field has helped North Dakota buck the national economic slump by creating new jobs and tax revenues. 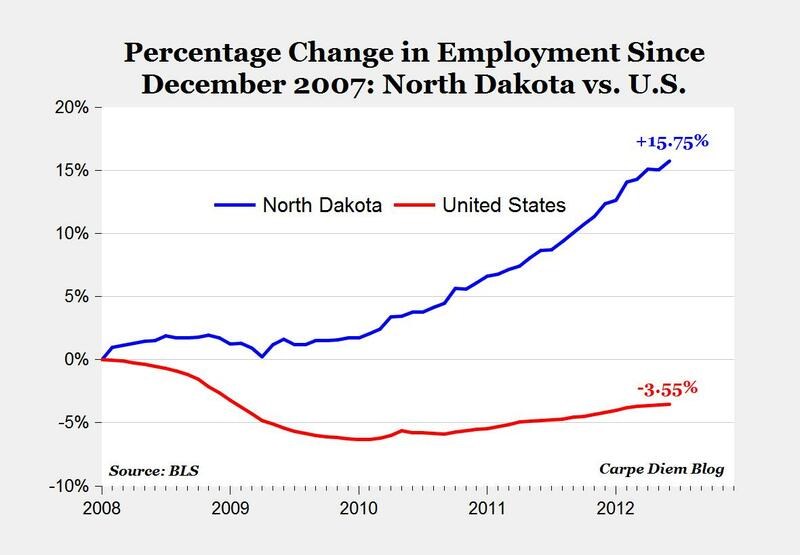 Thanks to the Bakken, North Dakota has the lowest unemployment rate and fastest-growing economy in the nation (see chart above comparing job growth in North Dakota to the job shrinkage nationally since December 2007). As the oil industry completes its infrastructure design phase and enters its full development phase in 2012 and 2013, there’s good news for residents, officials and community leaders in the oil communities experiencing this remarkable growth. Soon, nearly all of the infrastructure needed to develop the Bakken will be in place, and western North Dakota is settling into a period of steady growth. We appreciate North Dakotans’ cooperation and patience in tackling the challenge of infrastructure in the Bakken. Now that the area of the oil field is defined, the objective going forward is to optimize production and improve efficiency over the lifespan of the field, which is projected to be longer than 30 years. One of the great blessings of the Bakken is that it is being developed with modern technology. Horizontal drilling and Continental Resources’ EcoPad technology enable us to drill several wells from just one drilling pad, significantly reducing our footprint in the field. Yes, there will be thousands of new wells drilled in the Bakken, but that drilling activity will be spread out over the next 30 years using the most efficient and ecologically sound technology available. In addition to using advanced technologies, the oil and gas industry is building permanent employee housing and installing new oil, gas and water lines this summer and beyond to reduce truck traffic on the roads. Through oil and gas taxes, the industry is also responsible for $1 out of every $4 of state revenue. Due to the dramatic increase in tax revenues, North Dakota is making unprecedented investments in infrastructure in this region. Last year, the Legislature approved $1 billion in improvements, including the expansion of highways, water treatment plants and sewer lines in oil and gas producing counties. North Dakota has been blessed with an abundance of natural resources, including some of the richest agricultural land in the world and now the nation’s largest oil field discovery in more than 40 years. Adding the development of the Bakken to the arsenal of North Dakota’s resources has made North Dakota the premier state in America, lessening our dependence on foreign oil and, in fact, leading the way to achieving North American Energy Independence in the next decade. I believe the best of the Bakken for North Dakota is yet to come – it’s going to be a bright future in the Peace Garden State." Update: It's not just shale oil that is making North Dakota's energy future look brighter and brighter, but the state's shale gas production is expected to increase nearly sixfold by 2025, making North Dakota a major player in the U.S. market, according to a report released Wednesday. Continental started drilling the Bakken in 2004. Eight years later it still cannot finance its operations. Last year needed about a billion in new debt and share issuance to close its financing gaps. There is still little evidence that the company can produce decent returns over a period of time and given its depletion rates is stuck with a model that does not work very well. We can get excited about the company when it shows that it can pay dividends without borrowing more money. Continental Resources had almost $2 billion sales over the last year, revenue growth of 64%, gross profit of $1.5 billion, net income of $635 million, ROE of 31%, ROA of 12%, and profit margin of 33.25%. What about real cash flow? Does their 10K look rosy? Any shortfall has been and is expected to be funded mostly, if not entirely, through asset sales as we rebalance our oil and gas reserve and production portfolio in favor of lower risk, geographically more secure and higher return assets. So VangelV and Bart, not that this will shut you up, as it is clear you do nor respond to hard data, logic, or truth, but HESS IS SELF-FINANCING THEIR BAKKEN EFFORTS, that's what they said in the 10-K filing. If they lie in their 10-K they get into a lot of trouble. They are also selling assets in other areas with more political risk (think Tanzanian Royalty) and that have lower rates of return than the Bakken. The red lights are blinking across the exuberant U.S. oil patch! "Interesting" how you provide no link to either the call or the 10K, and how they actually ADMIT that the large shortfalls must be funded by asset sales. "Interesting" that they actually ADMIT that the large cash flow shortfalls must be offset by asset sales. No link to the call or the 10K too - fail. If I can borrow money cheaply, have a hard income-producing asset as collateral, and I can make 10% to 20% more than I am paying in interest, then I would be insane *NOT* to borrow the money. It's still "interesting" that they actually ADMIT that the large cash flow shortfalls must be offset by asset sales. You have accidentally and inadvertently proven Vangel correct about cash flow. If you can pick any EUR you want you can make up any profit that you choose to. Nortel and other producers of hardware reported a great deal in profit for years but had to keep writing off plant and equipment when they were no longer useful for their purposes. If you counted all those write-downs Nortel never made a profit in the 1990s. The same is true with the shale sector. You can claim that your well will last 30 years and choose to write off the drilling costs over that period. In the first year or two you get a decent IP but very little in cost and get to report a nice profit on that well. But the fact is that nearly half the production that will ever come from that well takes place during the first 18-24 month period. Instead of reporting a cost of $700K or so proper accounting that reflects what is going on in the real world would require a reporting of $5 million during that period. That is a difference of $4.3 million, hardly immaterial and more than sufficient to turn a loss into a nice profit. The problem for this game is that is has a limited shelf life. The company has to pay dividends and show positive cash flows some time or risk investors abandoning it. And just like Nortel you cannot avoid those write-offs for very long. Expect Continental to write down some of its leases in the next two years or so. If you want to invest in energy look at conventional players and well run coal companies. I suggest that you look at the filings. The 10-K showed that in 2011 the company produced $1 billion. Capital spending was around $2 billion, requiring around $1 billion in new financing. That is seven years after the company drilled its first well in the Bakken and at a time when it is drilling its most profitable targets in the core areas. For Mark's dumb predictions to come true the company and the rest of the industry will have to move outside of those core areas. If you want to claim success show me dividends that pay investors to stay with the strategy and for taking the risks. If eight years in the area are not enough to make the company self financing how long should we wait? LOL...The company Mark quoted is Continental, not Hess. Hess is much more diversified and actually pays out a dividend. Try using actual shale producers when making your point that shale production is profitable and self financing. It would make you more credible. Sorry my friend but he moved the pea and you missed it. Mark was quoting Chairman and Chief Executive Officer Harold Hamm of Continental Resources but our friend is showing you statements from an integrated company that has many other assets including more than a thousand gas stations. I would expect Hess to show a decent profit and solid cash flows. But that is not what Continental is showing and while Hamm is getting paid, investors have yet to see any dividends to reward them for taking the risks. The main points of the editorial were about the current and future shale-related fortunes of the state of North Dakota, not the fortunes of one company. Any weaknesses of one company, Continental, don't necessarily detract from any information in the editorial about North Dakota's economy. Sorry my friend but he moved the pea and you missed it. Yes, I did goof and didn't look at the change in company names... but Hess still seems to have cash flow trouble given that they're doing substantial asset sales - no? And the "THE MAJORITY OF OUR TOTAL SPEND HAS BEEN FUNDED WITH CASH FLOW FROM OPERATIONS." means that it could be as low as 51%, as in weasel words. I agree but my point remains the same. The shale industry has not shown itself to be capable of self financing its operations. As I wrote on a number of occasions, if you let me pick the EUR I can produce any profit level you want. And if you let me guess about the quality of my rock and use the 6:1 energy equivalency ratio I can show whatever reserves you want. This is why cash flows are so important. Since we have to be fair to recent entrants just starting operations we cannot hit them too hard for the very large negative cash flows. But given the stated decline profiles we can make serious demands of companies that have been producing for five years or more. And those companies are still having major problems with financing gaps that have to be filled by diluting existing shareholders, borrowing, or selling off assets. That means that the models are not sustainable and that some time around 2015 or so we should see a peak for Bakken oil production. At that point the state will have to make adjustments and look for a new source of employment growth and new tax revenues. You of all people should know that we have to stand back and look at the bigger picture if we are to try and make accurate predictions about future events. While the future is not certain we can make a pretty good guess about shale. In 2011 the company spent about $1.5 billion more that it generated from operations. But it is perfectly acceptable to have negative cash flows for a while if you are building facilities that will generate future profits. Hess has so many different operations in many areas that it is difficult to follow what is going on by looking at the filings superficially. That requires more time than I am willing to spend. Not necessarily. The company could use the cash it generates from its other operations to fund shale drilling. But that does not mean that shale production can be self financing. I'm all over companies with fast-growing revenue, large profits, that can finance their capital spending with either free cash flow or cheap debt... sounds like Hess and CLR. Like I said, stick with Tanzanian Royalty, and I hope bart is enjoying his Environmental Defense Fund and Greenpeace meetings, in between listening in to conference calls for ShortTheBakken.com. But that does not mean that shale production can be self financing. I don't own Tanzanian Royalty, just a miner mutual fund on which I'm up about 900% since 2004. Love the personal attacks though, it means you have nothing factual or substantive and can only act like a little girl etc. Who says that debt for these companies is cheap? And cheap debt did not help pets.com or the house builders. VangelV: So the CFO of Hess, a multi-billion dollar, massively successful oil company with a distinguished history in the oil business is a weasel? Hess is a company that operates gas stations and has revenues from around the globe. There is no evidence that it is making money from shale oil or that its shale oil operations are self financing. Mark brought up Continental, which is primarily a Bakken player and has been drilling wells in the region for eight years. The fact that it still has to keep borrowing is a problem for those looking for a sound business model, a fact that you are ignoring. I made a lot more money from TNX than you ever will from a Bakken player. And if you are paying attention you will find that the shale gas companies are giving money to the Environmental Defense Fund and Greenpeace to help shut down coal mines. And if you are paying attention you will find that the shale gas companies are giving money to the Environmental Defense Fund and Greenpeace to help shut down coal mines. Not shocking, except perhaps to those who don't do their homework or due diligence... or don't understand what Orwell or "The Road to Serfdom" etc. were talking about. I made a lot more money from TNX than you ever will from a Bakken player. I was there on the old DR forum when you owned TNX. I think you bought it, if memory serves, around 20 cents and sold it at over $6. After all, given the production data and so much noise being made by people like me and by good analysts it will be hard to argue that their assumptions are sound. Not quite. While I bought early in the game it was not early enough. My average cost in 2002 was around C$1.20 (US$0.76) and most shares were sold early 2006 at C$8.31 (US$7.13). While not great I will take it. I hold a few shares because I like to ask the Chairman a few questions during the AGMs and the subsequent meeting for people who are interested in the PMs and want to look at issues beyond the company. Sinclair is a very bright guy who has been around the block many times and has links to legendary investors and traders. By the way, one other interesting little factoid about the wonders of natural gas. One might think that with all the power companies that have or are switching to it that electricity rates have gone down... and it's outright wrong. Funny but I seem to recall that Mark has been posting about how rates are falling because of falling input costs. Check new post on falling real electricity prices for residential, commercial and industrial users. Not quite. While I bought early in the game it was not early enough. Oh drat and darn... you only had about a 6 bagger. Agreed on Sinclair as you know, although I still wish that he wasn't quite as much of a perma-bull - and also understand and agree with why he goes there. One interesting thing about Hess is that it is a long-term North Dakota players and it was widely noted a few years ago as Bakken players were taking shape that Hess's acreage was basically already Held-by-Production through wells in other formations. Hess is probably unique among Bakken players that it doesn't "Have" to drill to hold acreage. Any Cap-Ex that they throw towards the Bakken is totally voluntary. Vange>>I made a lot more money from TNX than you ever will from a Bakken player. Made a lot of money on Brigham-I saw the Bakken coming and I wanted to be a part of it. In at low single digits-out at $38 (or whatever they sold the company) at). I am sure you will just slam it for some reason-but I would argue those were real profits(not trading profits) because it was taken when the company was sold to StatOil and a REAL-WORLD value was placed on the company. Congrats on the Brigham investment! Also, Brigham/Statoil just built a large office building just down the road from the old family farm site, in an area west of Williston that just used to be a open farm field. The level of development going on in the Williston area just totally dwarfs the last boom in the 1980s, not even close. The old family farm sections are now being engulfed by oil-related development, and it will all (2 sections) be built over within about 2 to 3 years I suspect, at the current rate of development. If oil prices go up above $120 again, then even faster. Brigham Exploration never made any real profit on shale production. It was using debt to keep drilling and found a sucker to sell itself to. That is no different than all those tech companies that were acquired during the tech boom. For the record, my claims were not made after the fact. Bart and I used to argue on the DR site which no longer has a discussion forum. It was on this site that I recommended a position based on physical gold and silver, royalty plays, and juniors for those that were interested in gambling. TNX was one of the juniors that did very well. Others did much better. Some were taken out while others will go bankrupt for a number of possible reasons, not all of which have to do with bad management or bad properties. The point is that you can be fairly confident that your collection of gold and silver exploration and mining companies will return a good return over the next decade or so because they have assets that can produce good returns to those that acquire them. There is no evidence at all that the same is true of the shale assets in the Bakken. We have already seen the shale gas investments blow up and wind up destroying capital as producers have to sell at a loss. There is no evidence that outside of a few core areas there is any money to be made in shale oil either. And as I pointed out, the write-downs have already began. I expect that Statoil will write down its Bakken assets just as Encana just did. For the record, my claims were not made after the fact. Bart and I used to argue on the DR site which no longer has a discussion forum. It was on this site that I recommended a position based on physical gold and silver, royalty plays, and juniors for those that were interested in gambling. TNX was one of the juniors that did very well. Others did much better. Confirmed... and we sure did have some arguments. Some of my best charts, including the reconstruction of M3 months before anyone else and busting the ECB for gold buying/selling, occurred during that period. pets.com used equity financing, not debt financing. Debt financing is a perfectly good idea if you are in a capital-intensive industry with high up-front costs and payouts over the long term. Heck the tax code is designed around this. Most of the very successful startups I have been involved with either lose money up front or just break even while they build up market share, sales forces, new product lines, etc. Like Brigham, they then often get bought for massive sums. You're missing the point about value-add. Dell bought Compellent because Compellent had a key technology (thin provisioning integrated with VMware) and a significant market footprint in this space, but they didn't have the distribution Dell had. So economically, it made a huge amount of sense: Compellent's product line gets distributed efficiently throught Dell's efficient channel, and from Dell's perspective they didn't waste any money trying to innovate in a risky, expensive space. They basically bought revenue. Again economically a good idea (Mark Perry correct me if I am wrong here). Just google "statoil" and "brigham". There was a long article in Forbes I think about StatOil. They had to get into the Bakken because most of the other oil plays are in very risky political environments where they have trouble predicting what will happen (like Argentina appropriating the Spanish oil company's assets after that company found oil in Argentina -- basically pure thievery). The Bakken is in North Dakota. It doesn't get more conservative, stable, or pro-free-market than that. The other thing is StatOil needs the horizontal drilling expertise because with its broad geographic reach, it can apply this to other tight oil fields with that potential. This is why StatOil paid Brigham billions of dollars, and why it made perfect sense economically, and why Breaker Morant is sitting on a nice pile of cash from the sale. I have no problem with using debt. But eventually you are going to show that your operations are self financing. I keep using the Nortel example because that is the closest that we have to the shale gas situation. Nortel made real products and sold them in a competitive market place. Its stock took off and made many millionaires in a short period of time. But when you looked at the filings you saw that the company was chewing through cash and needed to keep borrowing to stay in business. Yes, it reported many profits. But it never made any real profits because those that were reported were based on low depreciation costs. The company wound up writing off assets that it claimed were 'one time' over and over again as the bubble was building. Anyone who followed the picture clearly saw what was happening and avoided the shares even though the bubble made a profit easy for those willing to take risks. But once the primary turn took place the millionaires and latecomers were doomed and lost most of the value of the shares. In the end the price fell from around $120 to a few pennies. The same will happen to shale. And let me note that I do not respect after-the-fact statements and narratives very much. I like to look around and make predictions about the future. As I pointed out the majors have already begun to report trouble in the shale patch. They spend much of their capital in the shale formations but get very little of their revenue from those formations. And while some accounting rules may allow them to claim profit from operations it is only a matter of time until we see another write-down like the one from Encana. Most of the very successful startups I have been involved with either lose money up front or just break even while they build up market share, sales forces, new product lines, etc. Like Brigham, they then often get bought for massive sums. In an early stage of a bubble many startups are taken out by bigger companies looking to get their share prices higher. Nortel bought many small companies at a nice premium. But that did not make Nortel profitable or allowed it to escape the consequences of reality. And as I said, I can go through the records and make all kinds of claims after the fact. But the only way to have credibility is to make predictions about the future. In the shale sector I have argued that outside of a very small core area in the decent formations there is no money to be made by investors. The average shale company will never make money from producing shale gas or oil so your only hope is to find a fool that will pay up for the assets and that you are smart enough to stay away from the sector once the shares have been taken away. From what you are writing you certainly do not know that producing shale oil and gas is a terrible business. That means that your investment will remain very risky unless you recognize the bubble and move your capital away from it. I give up. I have absolutely no idea what you are saying in your last post, it doesn't make any sense at all. What I am saying is that one can make a good return buying a bad company during a bubble. For Mark to be right the production of shale gas and oil has to be self financing. It isn't. As I said, if Mark was right when he was hyping up shale gas not very long ago we would not have the companies report large losses as they sell their gas for a fraction of what it costs to produce it and the early Bakken developments would still show increased production levels. But we are not seeing it. The profitable Elm Coulee, which was in the best area is now producing much less than it used to five years ago and all the new investment in Montana has not been able to get production levels to 2006 levels. ND is exactly in the same boat as Montana and at best we are going to see a very similar production profile. At worst the write-downs will cut off new financing and production will fall off a cliff. When it does ND will find itself in the same position as Alberta did in the early 1980s and the bursting bubble will drive down real estate prices to levels that are lower (in real terms) then they were when the ride began. You can keep talking, but as I said, what you are saying makes no sense at all. What part of, 'the shale industry's operations are not self financing,' do you have trouble understanding? > self financing,' do you have trouble understanding? What part of "so what" don't you understand? prove I'm right" don't you understand? So what? For Mark to be right the shale operations have to be self financing. They aren't. That means the last words on this issue will be, "we told you so," from the energy realists. How about that; we have another write-down of shale assets, this time from BHP. A year and a half after BHP Billiton purchases shale assets from Chesapeake Energy it finds that the assets were not what management expected and writes off $2.84 billion out of the $4.75 billion purchase price. Not that is more than half of the original price and that the purchase included pipeline assets that have some real value. It seems to me that Statoil will be writing off the Brigham purchase some time in the next few quarters. Funny how those dumb foreign companies keep falling for accounting scams and hype and wind up buying overvalued assets from American companies looking for a quick score. S/he loves to move the pea around and go off on tangents that have nothing to do with the points being argued. I have said that if I am right we can expect to see write-downs of shale gas assets in the next year or two. I also believe that we will see some shale oil write-offs some time after the shale gas scam is evident even to optimists like Mark. I have been out here now for two years (in the baken ) its all a scam ..... everyone taking advantage of the situation. Oil corps ripping us off. I kinda lost my job because i have an idea that would save oil corps millions. but yet cut down profits for contractors....there theory is, "oil corps yank us lets yank them"
lessening our dependence on foreign oil and, in fact, leading the way to achieving North American Energy Independence in the next decade. WOW thats deep. thats what they have been saying for years. We as americans are dumber than a box of Rocks. But yet smart enough to yank our own people.